This article is about the ancient kingdom. For the region in Somalia, see Puntland. The Land of Punt, also called Pwenet, or Pwene by the ancient Egyptians, was an ancient kingdom. A trading partner of Egypt, it was known for producing and exporting gold, aromatic resins, blackwood, ebony, ivory, and wild animals. The region is known from ancient Egyptian records of trade expeditions to it. Some biblical scholars have identified it with the biblical land of Put. The exact location of Punt is still debated by historians. 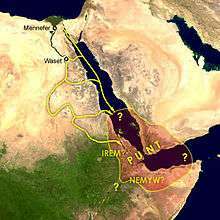 Most scholars today believe Punt was located to the southeast of Egypt, most likely in the coastal region of what is today Somalia, Djibouti, Eritrea, northeast Ethiopia and the Red Sea coast of Sudan. However, some scholars point instead to a range of ancient inscriptions which locate Punt in the Arabian Peninsula. It is also possible that the territory covered both the Horn of Africa and Southern Arabia. Puntland, the Somali administrative region situated at the extremity of the Horn of Africa, is named in reference to the Land of Punt. The earliest recorded Egyptian expedition to Punt was organized by Pharaoh Sahure of the Fifth Dynasty (25th century BC). However, gold from Punt is recorded as having been in Egypt as early as the time of Pharaoh Khufu of the Fourth Dynasty. Subsequently, there were more expeditions to Punt in the Sixth, Eleventh, Twelfth and Eighteenth dynasties of Egypt. In the Twelfth Dynasty, trade with Punt was celebrated in popular literature in the Tale of the Shipwrecked Sailor. In the reign of Mentuhotep III (11th dynasty, ca. 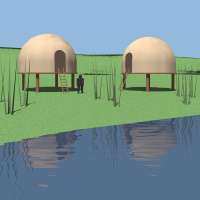 2000 BC), an officer named Hannu organized one or more voyages to Punt, but it is uncertain whether he personally traveled on these expeditions. Trading missions of the 12th dynasty pharaohs Senusret I, Amenemhat II and Amenemhat IV had also successfully navigated their way to and from the mysterious land of Punt. At times, the ancient Egyptians called Punt Ta netjer, meaning "God's Land". This referred to the fact that it was among the regions of the Sun God, that is, the regions located in the direction of the sunrise, to the East of Egypt. These eastern regions' resources included products used in temples, notably incense. Older literature (and current non-mainstream literature) maintained that the label "God's Land", when interpreted as "Holy Land" or "Land of the gods/ancestors", meant that the ancient Egyptians viewed the Land of Punt as their ancestral homeland. W. M. Flinders Petrie believed that the Dynastic Race came from or through Punt  and E. A. Wallis Budge stated that "Egyptian tradition of the Dynastic Period held that the aboriginal home of the Egyptians was Punt...". The term was not only applied to Punt, located southeast of Egypt, but also to regions of Asia east and northeast of Egypt, such as Lebanon, which was the source of wood for temples. The majority opinion places Punt in Northeastern Africa, based on the fact that the products of Punt (as depicted in the Hatshepsut illustrations) were abundantly found in the Horn of Africa but were less common or sometimes absent in Arabia. These products included gold and aromatic resins such as myrrh, frankincense, and ebony; the wild animals depicted in Punt included giraffes, baboons, hippopotami, and leopards. Says Richard Pankhurst: "[Punt] has been identified with territory on both the Arabian and the Horn of Africa coasts. Consideration of the articles which the Egyptians obtained from Punt, notably gold and ivory, suggests, however, that these were primarily of African origin. ... This leads us to suppose that the term Punt probably applied more to African than Arabian territory." 1 2 Shaw & Nicholson, p.231. 1 2 Dimitri Meeks – Chapter 4 – "Locating Punt" from the book Mysterious Lands", by David B. O'Connor and Stephen Quirke. ↑ Breasted 1906–07, p. 161, vol. 1. ↑ Breasted 1906–07, pp. 427–433, vol. 1. ↑ Breasted 1906–07, pp. 246–295, vol. 1. ↑ Breasted 1906–07, p. 658, vol. II. ↑ Breasted 1906–07, p. 451,773,820,888, vol. II. ↑ Pankhurst, Richard (2001). "The Ethiopians: A history". ISBN 978-0-631-22493-8. El-sayed, Mahfouz (2010). "Amenemhat IV au ouadi Gaouasis" (PDF). BIFAO. 110: 165–173.